A Look at Tropical Storm Michael's Unexpectedly Intense Winds in Central N.C.
More than a million people in North Carolina and Virginia are without power this evening as energy crews try to repair the damage caused by Tropical Storm Michael's passage on Thursday. The Piedmont region was particularly hard hit, unexpectedly experiencing high-end tropical storm conditions for more than an hour during the height of the storm. I live in Rockingham County, North Carolina, one of the hardest-hit areas and a county that saw nearly 70% of its residents lose power during the worst of the storm. Nasty conditions were in the forecast for central North Carolina for days before the storm. The main risk was always going to be flooding from heavy rain, which we saw in abundance. Tropical storm warnings were in effect for many inland locations to reflect the risk for high winds during the storm, but the warnings were mostly confined eastern parts of the state in the lead-up to the storm on Thursday and only expanded westward on Thursday morning. The storm here in Rockingham County was relatively tame for most of the day. It poured all day. The winds picked up a bit in the early afternoon hours as the center of Tropical Storm Michael drew closer to the area. I even tweeted a video of the heavy rain and breezy conditions to make note of how well the winds were behaving despite the heavy rain and our proximity to the center of the storm. I was in the living room around 3:00 PM when I heard a loud thunk on the roof. I turned around to look out the window and saw a cloud of leaves and debris swirling over our apartment building. I got away from the window in time to see the trees twisting and bending like I'd never seen during any of the awful storms we've had in the past. The sound of the wind was horrendous, made even worse by the howling whistle coming through the cracks in the windows and front door. The wind grew stronger as the minutes wore on, at first in buffeting gusts but eventually settling into a steady, constant roar. Shingles and window shutters peeled off of our apartment buildings. The blizzard of leaves and branches and occasional roofing debris and building material whizzed by the window and over the roof. The power flickered on and off for a while before finally giving out about 30 minutes into the ordeal. The wind finally started to calm down after almost an hour. I had to go back and piece together a timeline to make sure my perception of time wasn't biased by my anxiety. It really did last about an hour. The strongest winds began right around 3:00 PM. I first tweeted about the kicking winds at 3:02 PM. 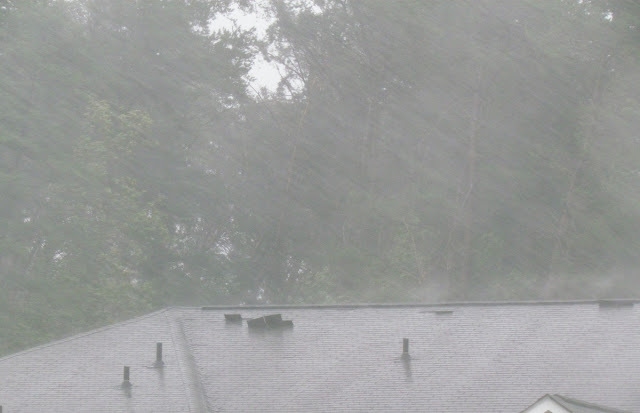 The National Weather Service issued a severe thunderstorm warning about ten minutes after the damaging winds started, alerting Rockingham and Caswell Counties, as well as several counties in Virginia, of the potential for damaging winds of up to 70 MPH. 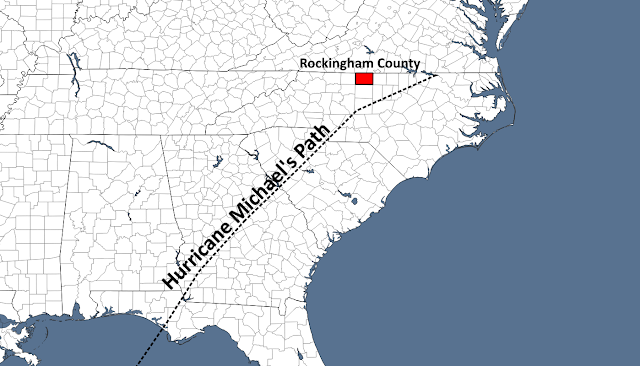 The Storm Prediction Center received a report of a possible tornado in Reidsville at 3:20 PM. A tornado warning was issued at 3:42 PM for more areas of rotation spotted on radar. I noted that the wind had finally died down around 4:00 PM. Nearly 70% of Rockingham County's 50,000 electric customers lost power at the height of the storm, and more than half still had no power by midnight the following day. The entire City of Danville, Virginia, lost power for the night after the storm. Many counties in central parts of North Carolina and Virginia saw more than half of their residents lose power as a result of the intense winds on Thursday afternoon, according to PowerOutage.US. I don't like to see the word "unexpected" in weather reporting. 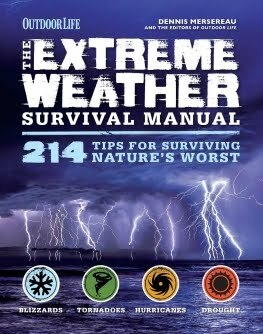 Many weather events really aren't unexpected. The folks in harm's way who didn't expect a natural disaster likely weren't listening to forecasts and warnings ahead of the storm. However, I feel comfortable using "unexpectedly" in the headline of this post because the extent of the damaging wind event we experienced was not well-forecast nor was it well-warned in the areas struck by the destructive winds today. Forecasts regularly mentioned the potential for wind gusts as high as 40 or 50 MPH as the storm passed to our southeast, but what we experienced went well beyond that—for all intents and purposes, parts of the Piedmont in North Carolina and Virginia experienced the winds of a high-end tropical storm for an hour. On top of that, the hardest-hit counties were never placed under a tropical storm warning, and the severe thunderstorm warning for 70 MPH winds wasn't issued until about 10 minutes after the damaging winds started howling. 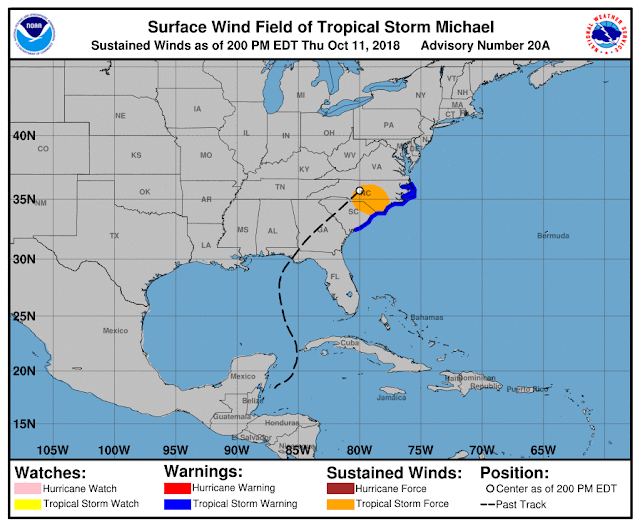 The National Hurricane Center found Tropical Storm Michael's maximum sustained winds around 50 MPH as the center of the storm passed through North Carolina on Thursday afternoon. The agency analyzed the extent of its tropical storm force winds reaching to the southeast of the center toward the coast. If that wasn't the bulk of the storm, then what was it? The windstorm we experienced in north-central North Carolina was more akin to a persistent severe thunderstorm than a full-fledged tropical storm. The winds in a tropical cyclone are driven by the storm's intense pressure gradient. Air rushes in to fill the void left by the low pressure in the middle of the storm, creating the destructive winds in a storm. The winds in a tropical cyclone are much stronger just above the surface than they are at the surface. Winds grow stronger with height because they're not limited by the effects of friction. The winds at the 850 millibar level—a few thousand feet above the surface—were blowing as strong as 70 to 80 MPH as Michael moved across North Carolina. What appears to have happened is that a line of very heavy showers—essentially, thunderstorms without thunder—formed on the northwest side of Tropical Storm Michael's center of circulation as it passed between Greensboro and Raleigh on Thursday afternoon. This enhanced convection was able to mix-down those powerful winds from just a few thousand feet above the surface. The persistent nature of the thunderstorms caused a prolonged period of high-end tropical storm force winds across parts of the Piedmont in North Carolina and Virginia. The National Weather Service will conduct a survey in Reidsville on Friday to determine if any of the damage was caused by a tornado. I wondered during the storm whether or not we'd been hit by a tornado right when the winds start, but I'd be surprised if the survey crew found that the damage was caused by anything more than straight-line winds. Most of the damage to our apartment complex was superficial—shingles and shutters torn and tossed, torn vinyl siding, tree damage—but there are lots of reports of more serious damage elsewhere around town and around the county. The seriousness of the destruction along the Gulf Coast dwarfs what we experienced here in central North Carolina, but such intense winds for such a long period of time is a heck of a thing to experience when you're not expecting it.